by Basil E. Eleftheriou, Ph. D., and by Basil E. Eleftheriou, Jr. 223 pgs. 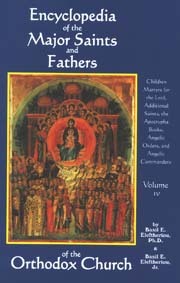 Fourth book in set of the lives of the major Saints and Fathers of the Church. Written in a style accessible for the average layperson. A wonderful spiritual resource for all. -with Children Martyrs for the Lord, Additional Saints, the Apocrypha Books, Angelic Orders, and Angelic Commanders.